Put a face to a name and meet the talented team behind your school's digital success! Responsive. Knowledgable. Funny. Helpful. Kind. Those are just a few of the words used to describe our incredible team over the past 20 years. Our deep bench of talented staff boasts award-winning designers, pragmatic developers, published writers, and numerous "school people" who've played important roles themselves in the classroom and in communications, admissions, institutional advancement, and academic departments of schools just like yours. We have former Directors of Admission, Technology, Head of Academics, Communication and External Relations Directors, Coaches, and Teachers — on staff, all working for you. Discover more about Finalsite's fearless leaders who guide their teams to design, create, code, and more, every day. Recovering boarding school teacher = jack of all trades. Former runner; current Krispy Kreme addict. Farm-raised; allergic to horses. Always trying to make things better. Lover of audiobooks, music, video games, my wife, daughter, and God. Here since 2011. Mom to 2 delightfully sarcastic octopus-eating children. Love laughing 'til I cry, cooking anything & everything, well-written books, icy cold Ketel One, art of all kinds, music - esp live. I’m the breakfast chef every Saturday morning where most of our family of eight gets together for a relaxing and enjoyable meal! I am a high-tech nomad who has travelled the world setting up and deploying technical solutions. Armed only with an innovative style of problem solving together with a voracious desire to see my team succeed - there is nothing that we will not achieve! Making the browser bend to my will since 1998 (man, I'm getting old). Father of 3, land owner, semi-retired bass player. Passionate about my family and education, and then if you add Newcastle United, Noel Gallagher and a nice bottle of Malbec you pretty much have all of the boxes ticked. I love a competitive environment and played field hockey and rowed in college. I am fortunate to have been involved with numerous amazing teams both athletically and professionally. I'm a mother of four. I have an 8 year old son and 5 year old triplet girls, the best surprise of our lives! 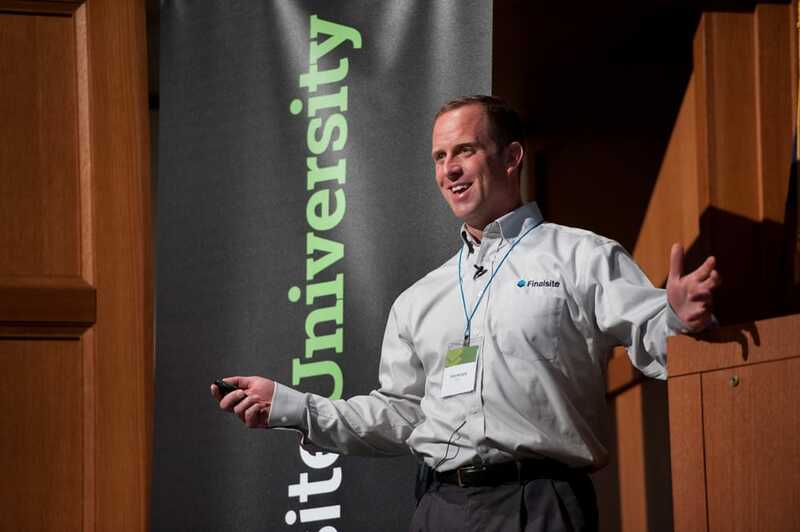 Jon founded Finalsite nearly twenty years ago, and he's remained true to his vision to provide a superior web software product to the education market, and has grown Finalsite to its position as the premier SaaS provider to more than 2000 schools worldwide. He is passionate about research and trends impacting schools and education, and is a sought-after advisor, keynoter, presenter and blogger on the latest research and best practices for school websites, social media, and inbound marketing to drive enrollment, engagement and fundraising success. A hula-bopping, HR consultant and girl guide helper. Loves the outdoors, camping, travelling, cooking, tennis, rugby, music, good wine and the company of great friends. Father of two; dozens of chickens, two goats, two dogs, two bee hives; trail runner, inclusive of painfully long speed hikes through national parks; gardener; aspiring woodworker. Foodie. Three cats, two daughters, and an awesome wife. Former hockey goalie, DJ, car salesman and IT director. Passionate about doing things the right way the first time. I love watching our team come together to create solutions to make life a little easier. I'm proud to hail from Charm City. Go Ravens! Enjoys being active in the great outdoors, a good book by a crackling fire on winter evenings, and occasional moments of peace in the tween and teen scene. Loves his wife, children and being outside whenever possible. Finalsite since Y2K. This team has all the answers (just try them!!) and will stop at nothing to put a smile on your face with a solution to questions of all sizes. Get to know the Client Success and Support all-stars. Spreading the word about Finalsite, crunching metrics and driving traffic, and planning events around the world are a few of this team's favorite things. Learn more about what makes the Sales and Marketing team tick! Former teacher and middle school principal. Runner, golfer, and Pittsburgh sports fan! I married up, have 3 amazing children, and reside in the great state of Georgia. True "believer" solid Cubs fan and native to Chicago. Passionate about making a difference in people's lives and helping the homeless. I am the blessed father of an adopted son (Samuel) , husband to a perfect wife (Gina), owner of a 90 pound German Shepherd (Barron) and unapologetic lover of HOT DOGS!! I am also a long suffering fan of all Atlanta sports teams. The OG California girl, born and raised! Love spending time with my 3 kids. I spend my free time playing soccer, softball, crossfit, gardening, and fishing. Competitive by nature! Proud Penn State alumni who likes to spend most of my spare time working with my hands or playing with our two great pups! I love life and all the adventure that comes with it. When I am not working, I can be found glass blowing, creating art, listening to live music, spending time in nature, traveling or just hanging with friends and family. I am often involved in some sort of creative project or nonprofit / charity fundraising endeavor. I am a mother, twin, hard worker, team player, an analyzer. I love the ocean, being with my family, laughing, learning, outdoor adventures, and music. Yoga teacher. Wedding cinematographer. Ice cream addict. Momma to the cutest Boston Terrier there is. Curious about humans. Writer and storyteller. Likes to be helpful. Hopeful. North and South Carolina native. Former Boston resident. Avid reader. Lifelong Packers fan. TV and movie aficionado. Father of cats; drinker of stouts. Proud ASU Alum. Proud Air Force Falcon Fan. Las Vegan native (Go Knights!). Closet nerd, travel junky, and family girl. Loves a good happy hour & ball game. In my house, I'm grossly outnumbered (wife, 3 girls, & girl dog), but undeniably smitten! I love people & play. You'll normally find me playing with my kids, instruments, sports, and in the great outdoors. I get a little nerdy when it comes to coffee, beer, and startups. Husband and father to three amazing kids When theres time i enjoy cooking, reading, golfing, anything sports and being outdoors. I am the one guy in the office that speaks English, yet no-one understands. I play rugby, for fun. My weekend car is a 1975 Triumph Spitfire, which is a work in progress. I've been in the States since 1998. I have worked at a Middle School and a High school in CT. My wife is a teacher and I have two kids that are still for sale to the highest bidder! Great listener, voracious reader, movie buff, Toronto Film Fest veteran and MVP of Aunts. I am a fan of classic NJ Rock (Bon Jovi/Bruce), movie theatre popcorn, Indiana Jones, binge watching Netflix, New England in the fall, and hanging out with my husband, four step kids (in their 20's) and two dogs. Independent school fundraiser and teacher turned marketing enthusiast. Loves cooking, travel, and all things French. Mom to a toddler boy and a baby girl with a wonderful husband and a giant Labradoodle. I am a sister of twins, a former competitive cheerleader and a current lover of knitting, crafting, sushi, turtles, and all things pumpkin. My wife and I live in Central NY with our Fox Red Lab Remy. Avid sports fan of the NY Giants, Yankees, and Bama football but definitely "Bleed Orange" for Syracuse sports! Overall, just enjoy being around people. I am a mom, soccer goalie mom, I like to paint watercolors, shop outlets, eat sushi, craft and am a big Yankees fan! This close-knit, caffeinated team is your command center for launching your site on time, under budget, and giving you the SEO and PPC insight that sends the right traffic your way. Find out what this group is up to when they're not making lists and checking them twice. Former farmstead cheese-maker turned web-junkie with a penchant for forest walks, local beer, and dogs. Mother of 2 kids who are cooler than me, UK citizen, still living in the '90s, likes concerts, the ocean, Fenway, cooking but not baking. Fan of all things Japanese, SciFi, and cats! Has been a Producer, Developer, and now QA. Web designer who enjoys photography, reading, traveling, and being with family and friends. Husband, dad, minion of one dachshund. Interested in all things historical, Wes Anderson films, Gordon Freeman, Red Sox, and Vermont's Cabot Seriously Sharp Cheddar cheese. A Philadelphia native who is quick to jump in her car to see where the road will take her, In her spare time Meghan enjoys photography and can be found outside taking pictures or inside creating unique soy-based candles for craft beer and wine connoisseur's enjoyment. In summary. Sunset chasing, exploring different cultures, love sports (football), cake (red velvet), history and music (jazz). An outgoing graphic designer who is a fashion chameleon that lives to lift heavy in the gym. " My name is Akua (Akq-wee-a). I am a web designer who loves watching Netflix and taking long walks along the beach. Film buff, classic rock fan (sings a lot in the office) and aspiring foodie. Loves a good design challenge or website build problem! I love good design and functionality, and have been with Finalsite for seven years. When I am not designing, I am a farm wife and mother of two who loves to sew, craft, garden and travel in her spare time. Hard working PM from across the pond at FinalsiteUK. HUGE Buckeye fan as well as Cleveland Sports teams, slightly addicted to Starbucks, Running and Gym enthusiast and 110% focused on my Clients. I’m a CT Pixelworker and runner of trails. When not in front of a computer, I’m probably traveling with my family. Enjoying this adventure! I'm a Mom to 2 crazy kids, a Wife to my wonderful husband, a CT native but I love to travel. Running, being crafty (or trying), the Red Sox, snazzy shoes, a good IPA and ice cream (not together) are some of my favorite things! An Eagles, Phillies, Flyers, and Sixers fan from NJ but living in Baltimore. When you see me I will remind you that the EAGLES WON THE SUPER BOWL! Husband. Runner. "Abide"
Britalian who enjoys long, romantic walks to the fridge. Avid snowboarder, aspiring guitarist, Manchester City fan, cinema buff and tech enthusiast. When I’m not managing projects, I’m passionately tasting either craft beer or fine wine with friends and family. CT born and raised, foodie, drinkie, theatre lover, gamer, constantly discovering the headaches expenses joys of home ownership. Cheap beer, expensive guitars, terrible action movies. fs 06', Loves; husband, kids, dog, wine, golf, clogs, and a good sense of humor! Hates to fly! I'm a San Diego native, a versatile visual designer and color schemer with a passion for pixel perfect web designs. I earned my BA from UCLA in Design Media Arts. I'm also a vegetarian foodie and a maté tea lover. Originally from CT, big Pats fan - not easy in Baltimore. Animal lover, I have a dog. Big time tech nerd. When I'm not managing projects I love shopping, dancing, music and food. I also have a hidden talent for accents and a love of soup. Expert web developer and professional fun-haver. My hobbies include eating pizza, petting dogs, and solving mysteries. I also like playing video games and binge watching Netflix. Displaced FL boy. Proud papa of three pitties. Obsessed with Star Wars and all things nerd. Go Hufflepuff! Web Designer, like learning new things, tech and video games! Nerd, Gamer, Head Banger. Code Monkey like Fritos. Code Monkey like Tab and Mountain Dew. Code Monkey very simple man. Mum to always smiling baby girl, love Frappuccino and anything to do with chocolate. Can’t get any work done without good music. Like doing pranks. Grilled cheese, cheeseburgers, anything with cheese, things that make me laugh, driving a van across New Hampshire with my buddies, my yellow dog, family. I am a father and a husband, not necessarily in that order. Listening to, playing and sharing music fills my soul, so let me know what YOU like to hear. Also, I may have paint on me, because I was throwing it at a canvas recently. Guitar Fighter, Gaming Champion, Dad Footballer, Dog Rambler. Mum, wife, dog lover. Brit, turned Dutchie, now trying out the US. Lifelong believer in the value of education & power of communication. Semi-obsessive gamer, music eclecticist, coffee enthusiast, pusher of pixels, connoisseur of dumb things and smart things in equal measure. Proud mom of three red headed sons and Jack, our Jack Russell Terrier. Avid runner, biker, skier, hiker. Wannabe world traveler and photographer. Wife and mother to two spunky daughters. Currently (and forever!) working on my house. Loves coffee, DIY, running and the beach. This hardworking crew keeps Finalsite’s essential back office functions humming and everyone at Finalsite happy! Arty Crafty kinda gal, gardening, architecture, fashion & crafts a passion. Love travelling and finding new paradises to share. Work is always a hobby and never a chore.. Lover of all animals and supporter of their causes, country music, NE Patriots and Boston Red Sox. Sue enjoys the simple things in life and officially loves flying!!! I'm a mom to 2 amazing girls, Davia (My Theatrical Girl) and Lexi (My Dancing Gymnast). In my spare time, I enjoy being a hobby breeder of Golden Retrievers, Cooking, Camping, and Reading. I love Fried Clams and Cupcakes. I’m husband to my beautiful wife Meghan and father to my 1 year old sumo wrestler son Nolan. I’m a huge Bruins fan and love all things hockey. In a former life, I was an avid gamer and a P90X graduate. Meet the team of code-savvy innovators who imagine, build, test, and improve all of our products from the ground-up. Angel Mom of one, proud Mom of all three. I enjoy walking, bike riding, jazz & country music. If something is broke, I want to fix it. 20 year software development veteran, lifelong musician, and timeless voice of a generation. I enjoy fun, and also karaoke. Dad. Golfer. Recovering chef. Terminally sarcastic. Rock and roll. Gadget enthusiast. "Wake now, discover that you are the song that the morning brings but the heart has its seasons its evenings and songs of its own..."
I enjoy smoking cigars, playing or making video games and going outside. Co-Creator of Addison and Theodore Ecklund. Obsessed with efficiency. Stubborn DIYer. Horrible at sarcasm. I am a daughter, sister, aunt, great-aunt, southerner, client turned employee, friend, Mormon, underground-canoer, singer, baker, equestrian enthusiast, graphic designer by heart. Father to three amazing kids. I play to win, and strategy is my middle name. I love working out the kinks, and making people happy -- all done quietly in the background. Developer by day. DIYer, cyclist, and baller by night. Love to grill pizzas, exercise, and avoid the TV. I know nothing about movies. Love my family. I like working out, hiking, one coffee a day, sunsets, crackling fires, solving problems, customers, new challenges, all forms of aircraft, classic cars from the 60's and 70's, and I am a dog lover. Graduated college last year - Does game hacking/development as a hobby - Computer hardware enthusiast - Master League Starcraft 2 protoss player on Korean ladder. In love with coding and software developing since the age of 14 (So a long... long time ago in a galaxy far far away....). Also love Cats, Weight Lifting, Salsa dancing and lots of different geeky stuff. Canadian, UX/UI professional, type 1 diabetic. Passionate about user-centered design and discovering what makes people tick. In my spare time I enjoy cooking, traveling, and studying history. Father, geek, surfcasting fisherman, runner, and biker: the order depends on the day. Family man, adult child, future Tesla owner. In my free time I write novels and do yoga. I once high fived an astronaut. UConn graduate who joined Finalsite in 2011. I love my wife and two cats. I enjoy motorcycling, jetskiing, spending time outdoors, racquetball, and everything techy. A husband, father of three kids and 4 pets, he likes to come into work to enjoy the peace and quiet. When not at work, he can be found either in the kitchen cooking, or riding his motorcycle…he also likes referring to himself in the third person. My name is Alex Moreau; I work in the IT department at Finalsite (since 2007). I love gardening and fishing with my two boys Marcus and Matthew, they are my M&Ms. I enjoy learning new stuff, especially new technology, music and guitar, craft beer, running, soccer, playing with my kids, Cape Cod and thumb wrestling. I'm in a season of life where my 4 kids have taken center stage to a lot of my past interests like singing in an opera chorus, running a 1/2 marathon, or having money to spend on myself. Thankfully, they're amazing kids. I am a UConn computer science graduate who ensures Finalsite delivers the best software possible. In my spare time I enjoy video games as well as both cooking and eating good BBQ. Lover of family, travel, and adventure! Passionate about learning, boating, 3d printing, and anything technology! Other interests include EDM, psychology, philosophy, physics, futurism, and the singularity! Proud father, husband, and geek of all things science and technology related. Began his foray into web development with HTML nearly 20 years ago. I'd like to be described as a jack of all trades, but that could sometimes be a stretch. So, instead of practicing I diversify my free time between the things I love. I enjoy playing sports like hockey, softball and snowboarding. However, most of my time is taken over by video games, board games and time with friends. Started as Intern, hired as a Developer, evolved into a Product Manager. Hobbies: Travel, video games, watching sports, golfing and food. Traveller, tabletop gamer. I enjoy eating and spending time with my family, it's even better if I can do both at the same time! Finalsite's Board helps to inspire us and shape our vision. Learn more about selected members below. Does Finalsite sound like a place you'd like to work? Check out our current openings! Finalsite's Board helps to inspire us and shape our vision. Meet the members of our board.